Yesterday, I returned from a week at Senior High Camp at Laurel Ridge. By my count it was my 26th time being there as a counselor or dean. Which means that I have spent 6 months of my life at summer camp at Laurel Ridge. And I wish it could be more. There is just something about that place. It is the beauty of God’s creation; the mountains and trees and flowers and animals, the sunrises and sunsets, and, most importantly, the people. Each and every time I have been on that mountain, we have formed an amazing and unique faith community. Over the years, the names and faces of those people change. People come and go from the mountain, campers grow up and move on, counselors have other things come up in their lives that keep them from coming back. Life just goes on. But the specific people, while they matter greatly, aren’t what make that place special. It’s all of the people that make it special. Nor is it the beauty of the place that makes it special, all though it certainly helps. What makes Laurel Ridge so special, what has caused me to joyfully spent 6 months of my life there on that mountain, is the presence of God. God is certainly present everywhere. But being at summer camp at Laurel Ridge is to be in one of those “thin places”, one of those places where the distance between heaven and earth collapses. Thin places are where you feel like you can literally reach out and touch God, where you feel like you can hear God speaking, where God’s presence surrounds you and engulfs you and overwhelms you. It is where you don’t need to “be still” to know and see and feel who God is, but a place where you can’t help but see God in everything and in everyone. Summer camp at Laurel Ridge is the place where there is only one thing that matters. The place where nothing can worry us or prevent us from focusing or distract us. Laurel Ridge is the ultimate “Mary” place- it is the place where I can go and sit at the Lord’s feet, listen to what he says, and not worry about a thing, cause every little thing will be alright. It is the place to go deep into my faith and not be distracted by anything else. Laurel Ridge is life as it should be. It is a place where followers of Jesus can come together and be who we are-God’s beloved children, who are loved unconditionally, by God and each other. It is where we aren’t judged by the standards of the world, by what we wear or by how we act. It is one place where we aren’t judged by our faults and flaws, where we aren’t seen as or defined by what we do or don’t do, or by who who we ARE NOT. But it is the one place where we can be who we truly ARE; where we can be loved and accepted for simply being the beloved children of God. Over the years, I have spoken with many campers and counselors and they all say that summer camp at Laurel Ridge is the one place where they can simply be themselves, without having to be who others expect them to be, who others want them to be, who others often DEMAND that they be. That is a rare and precious gift to receive and a rare and precious place to find. We often talk about heading down the mountain and going back to the “real world.” But when we do, we are getting it backwards. Being at Laurel Ridge is what life should be like, it is how God intends for us to live and to treat each other. It is not something that is only found at Laurel Ridge, but for me and many others, Laurel Ridge is the one place where it can always be found; the one place we can go to experience life as God intends it to be, as opposed to life as we have created it to be. Summer camp at Laurel Ridge is a perfect illustration of the Mary and Martha story. This is one of those stories, like the Prodigal Son, where we can all easily identify with one of the characters. In the story of the Prodigal Son, we are either the younger son or the older son. Similarly, we are either Mary or Martha. But unlike the Prodigal, where we are at various times in our lives, both younger and older son, we don’t often switch back and forth between Mary and Martha. We are either one or the other, we are either Mary or Martha. We are Mary, sitting at the feet of Jesus, trying to be as close as we possibly can to him, listening to everything he has to say. Or we are Martha, running around, keeping busy, focusing on everything but Jesus. We can all pretty easily see ourselves as one or the other, Mary or Martha. As we hear the story it is hard to avoid the fact that we don’t really want to be Martha. Because Jesus really gives Martha a hard time. I have heard many sermons that try to explain this. Sermons that try to remind all of those Marthas among us that what they are doing is important, too. Over my eighteen years as a pastor, I have even preached them myself. But being up at Laurel Ridge this past week, thinking and praying about this story while I was there, makes it really difficult to do that today. After being there and focusing on the “one thing” that we need, I can’t stand here today and tell you that all of the other stuff matters. I can’t tell you that all of the “many things” that we use to distract ourselves, all of those things that occupy us and preoccupy us, all of those nonessentials that we turn into essentials, all of those standards that we impose on ourselves about who we are supposed to be and what we are supposed to do, those standards that we try to impose on everyone else about who they are supposed to be and what they are supposed to do, I can’t tell you that they matter. Because, at least in the context of today’s Gospel lesson, it’s pretty clear that they don’t. 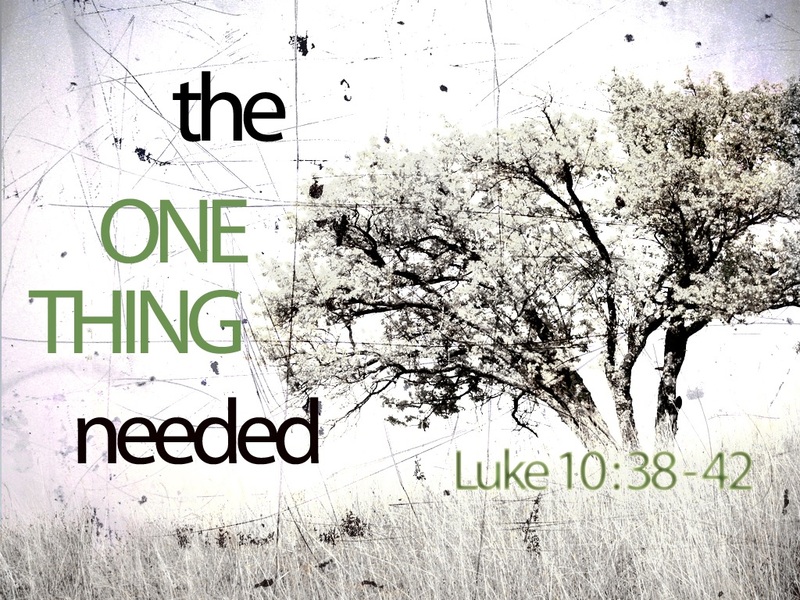 Jesus said, “Martha, Martha, you are worried and distracted by many things; there is need of only one thing. Mary has chosen the better part, which will not be taken away from her.” Not only is Martha so worried and distracted by her own stuff, her own need for control, for perfection, to have everything as SHE thinks it should be; not only is she so distracted by this stuff that she is ignoring Jesus herself, but she is also trying to keep Mary away from him too. She is trying to make Mary conform to her expectations, to her standards. Martha is choosing the “many things” that don’t matter, over the “one thing” that does. And the church is full of Marthas. The church is full of people who choose the many things that don’t matter over the one thing that does. The church is full of people who get so distracted by the nonessentials that they forget the essentials. The church is full of people who get so distracted by their own “stuff”, by their own needs for control, for perfection, to have everything as THEY think it should be, that they forget what God thinks is should be. While that by itself is harmful and damaging, it is made worse when they try to do what Martha did (and they always try to do what Martha did). Not only is it not enough for them to be distracted and worried by many things; by many things that don’t matter, rather than the one that does; but they have to drag everyone else along with them. And try to make them conform to their standards, to meet their expectations, to be who they think they should be, rather than who God created them to be. For Christ’s church to grow and live and serve as he intends it to, for the church to be what Jesus needs it to be, for the church to be what the world needs it to be, what the world is crying out for it to be, we have to take it back from the Marthas who have taken it over. We have to stop letting them force the church to focus on the many things, the many things that don’t really matter. We have to stop letting them drag us into their stuff, so that we can focus on God’s stuff; stuff like feeding the hungry and giving water to the thirsty, stuff like welcoming the stranger and clothing the naked, stuff like caring for the sick and visiting the prisoner, stuff like loving God and loving each other. Coming down from the mountain, back into the so called “real world”, that sadly changes. Down here it is easy to allow them to shift the focus to things that don’t matter. At least they don’t matter to anyone but them. When we allow that to happen, every time that we allow that to happen, we are moving further away from Jesus. It is time for the church, it is time for us, to get back to the one thing; the one thing that matters, the only thing that matters. It is time for us to sit at the feet of our Lord and listen to him, listen to what he is saying. It is time for us to allow him to create, to redeem, to bless. It is time for us to respond to him with faith, love, and hope. This Brothers and Sisters, is the one thing, it is the only thing. And we can not let it be taken away from us.